It really surprises me how close some of this stuff, which I made after October 1978, and possibly around December that year—and onwards, resembles a film which still hadn’t even come out. And I certainly didn’t have Donald F. Glut’s novelisation, which I bought in the summer of 1979. And details of the script—or even a synopsis—wouldn’t have been available to me in Ireland. I couldn’t afford to buy Starburst magazine at my age, and there was no internet! Above: Very reminiscent of their cockpit banter during the escape from Hoth—more than 1 year later! Foreshadowing the actual film to come, the friction between Leia and Han—already established in the first film ‘Star Wars’—is becoming willfully sarcastic and counterproductive! Han is struggling to get them to safety in the newly repaired Falcon, and Leia is snarkily getting in a jab about his “escape plan.” In the eventual film, Leia would go so far as to say—as they’re about to be destroyed by a tripod-laser cannon—while an under-pressure Han struggles to get their airborne, “Someday you’re going to be wrong, and I hope I’m there to see it.” Very helpful! But, Han is still cocky as hell here. 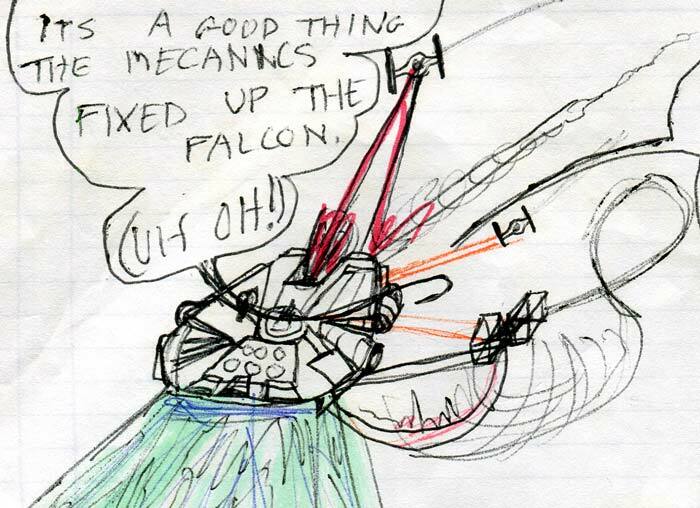 The Falcon has been repaired, but not by Han and Chewie at the Rebel base, but by mechanics. 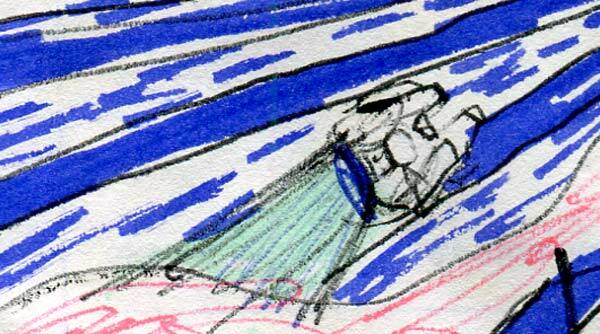 In the movie, the falcon’s Hyperdrive would be repaired by Lando’s mechanics (but later disabled by Vader’s people). 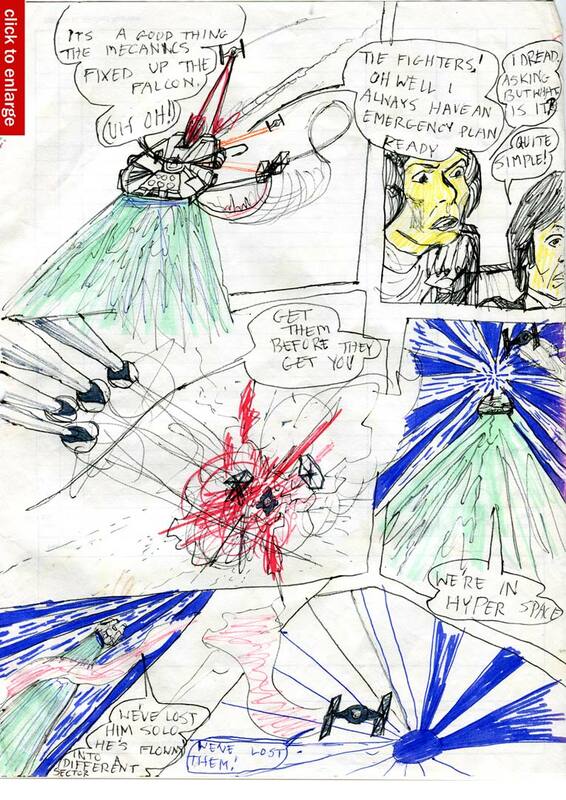 In this page however, Han has no problem making the jump to hyperspace. In the subsequent Empire movie, that broken down Falcon gag was a brilliant innovation. Wish I’d thought of it! Luke had once called the Falcon a “heap of junk” and Leia probably thought it was too. So in Empire, we have Han trying to prove them wrong, and the Hyperdrive keeps on breaking down. You can see how much I loved the TIE Fighter attack on the Falcon in ‘Star Wars’, because I eagerly did another one here. 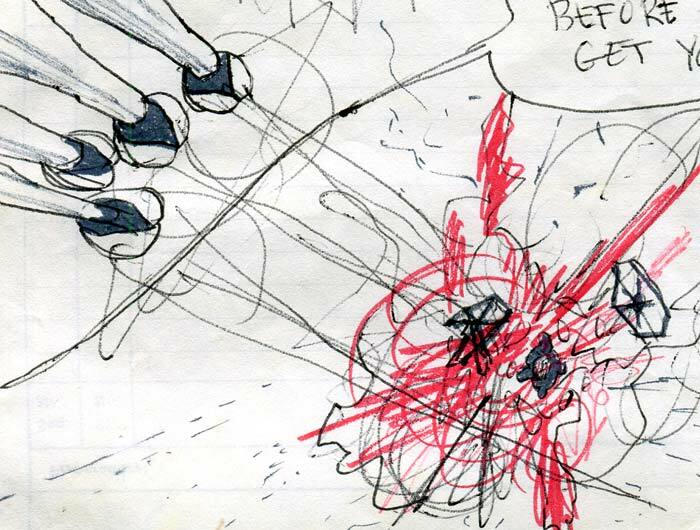 You can see how I handled the previous one from ‘Star Wars <here, nearly a year earlier. 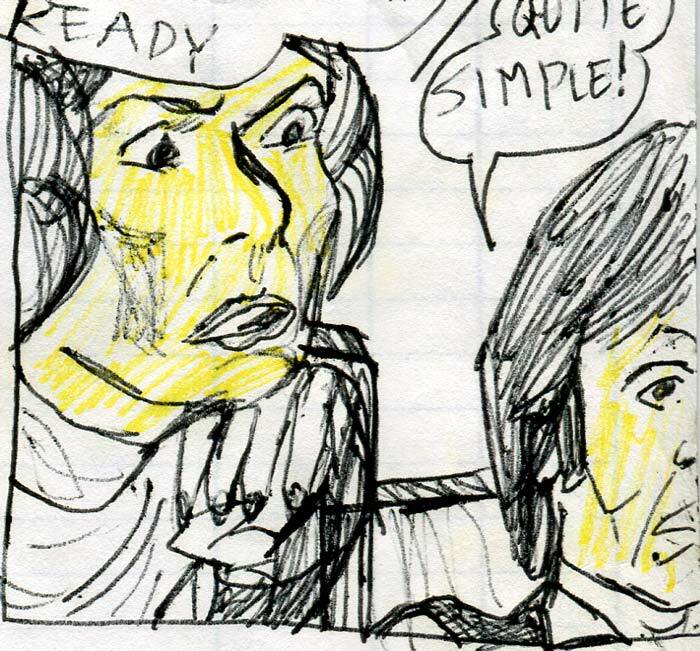 You can see how the TIE Fighter pilot’s dialogue line in the final panel was added later, in blue biro. Why? Who knows. It’s just a repeat of what Leia said. But once again it illustrates how I liked to loop back over older pages and add to them, whether that was drawing improvements, colour or text. I just looked at that last panel again, and actually, there’s something a little mournful looking about it. Poor TIE pilot. Maybe it’s just that a sad piece of Rey music was playing on the Force Awakens soundtrack album at the same time as I looked at it? ‘Must have been that.